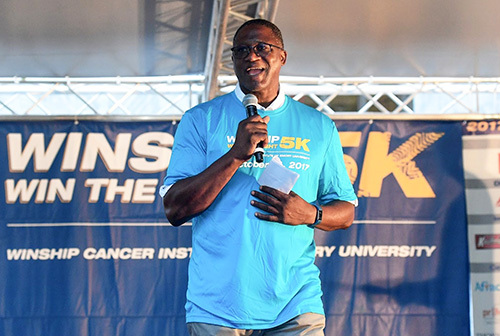 For the second year in a row, nine-time NBA All-Star and Hall of Fame inductee Dominique Wilkins will serve as the grand marshal of the Winship Cancer Institute Win the Fight 5K. For the second year in a row, nine-time NBA All-Star and Hall of Fame inductee Dominique Wilkins will serve as the grand marshal of the Winship Cancer Institute Win the Fight 5K. This year's run/walk will take place on Saturday, October 13th on the Emory University Quadrangle on Dowman Drive. Wilkins, who retired from professional basketball nearly 20 years ago, serves as the vice president of Basketball Operations and special advisor to the CEO for the Atlanta Hawks. Registration for the Peachtree Road Race qualifier is now open at winship5k.emory.edu. Anyone who is unable to attend in person has an option to join virtually, donate to the cause, and be recognized. "The Winship 5K Professorship gives Winship 5K participants the opportunity to support an outstanding faculty member and his or her cancer research program," says Walter J. Curran, Jr., MD, Winship's executive director. "Recognizing a Winship faculty member in this manner in their field of cancer research will impact Winship's cancer research work for years to come." For more information on the Winship Win the Fight 5K, log on to: winship5k.emory.edu or call (404) 727-6175. Also, like the Winship 5K on Facebook or follow on Twitter and Instagram.